An earthquake (also known as a quake, tremor or temblor) is the result of a sudden release of energy in the Earth's crust that creates seismic waves. Earthquakes are measured using observations from seismometers. The moment magnitude is the most common scale on which earthquakes larger than approximately 5 are reported for the entire globe. The most recent large earthquake of magnitude 9.0 or larger was a 9.0 magnitude earthquake in Japan in 2011. At the Earth's surface, earthquakes manifest themselves by shaking and sometimes displacement of the ground. When the epicenter of a large earthquake is located offshore, the seabed may be displaced sufficiently to cause a tsunami. News reports state that today, several cities of Pakistan's Sindh and Balochistan provinces were hit by a massive aftershock measuring 6.8, three days after a 7.7 magnitude earthquake struck the region killed over 500 people. The US Geological Survey said the quake struck approximately 250 kilometres (155 miles) north of the port city of Karachi. There has been no immediate reports of casualties or damage. Local media reported that the quake affected Balochistan and Sindh regions. It reportedly was also felt in Quetta, close to Pakistan's border with Afghanistan, and Karachi. Pakistan's Meteorological Department however measured the quake at 7.2 magnitude. Chief Pakistani meteorologist is quoted as telling Pakistani television that it was an aftershock from this week's earthquake and similar tremors could continue for weeks, Associated Press reported. The National Seismic Centre stated that the origin of this earthquake was once again Awaran. Reports state that rescue teams are still to reach several remote areas, including the worst-hit Balochistan's Awaran district near the epicentre of Tuesday's temblor. While the official death count stands at 515, unofficial figures are as high as 700, with more than 800 injured. The earthquake left more than 50,000 people homeless in these areas. In another disturbing news, an army helicopter carrying relief goods to the quake-hit areas was fired at in Mashkay area of Awaran district by suspected militants on Friday. The helicopter was not damaged in the attack. This was the second attack on an army helicopter in the area. Yesterday, two army generals, including the head of the National Disaster Management Authority, had a narrow escape when rockets were fired at their helicopter. Security personnel accompanying a team of doctors for relief operations were fired at on Wednesday. As one would recall on September 24, 2013, a major strike-slip earthquake rattled western Pakistan. On September 26, 2013, the Advanced Land Imager (ALI) on NASA’s Earth Observing-1 (EO-1) satellite captured the top image of that new island, which sits roughly one kilometer (0.6 miles) offshore. 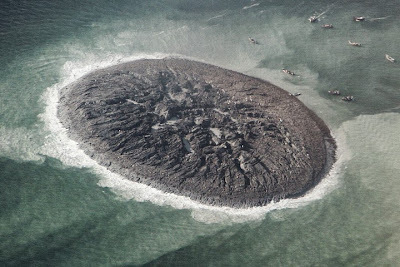 Likely a “mud volcano,” the island rose from the seafloor near Gwadar on September 24, shortly after the earthquake struck about 380 kilometers (230 miles) inland. In the satellite images, released by NASA, lighter shades of green and tan in the water reveal shallow seafloor or suspended sediment. 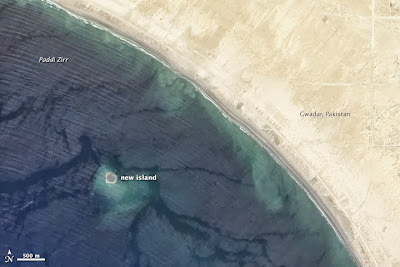 The water depth around the new island is roughly 15 to 20 meters, according to marine geologist Asif Inam of Pakistan’s National Institute of Oceanography. “The floor in that area is generally flat, but the gradient in this area changes quite abruptly,” Inam said. 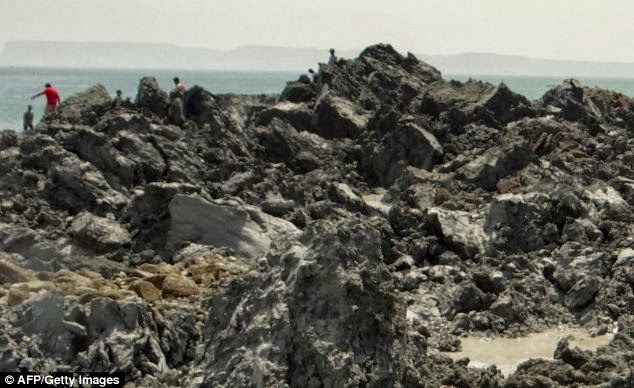 “The island is really just a big pile of mud from the seafloor that got pushed up,” said Bill Barnhart, a geologist at the U.S. Geological Survey who studies earthquakes in Pakistan and Iran. “This area of the world seems to see so many of these features because the geology is correct for their formation. You need a shallow, buried layer of pressurized gas—methane, carbon dioxide, or something else—and fluids. When that layer becomes disturbed by seismic waves (like an earthquake), the gases and fluids become buoyant and rush to the surface, bringing the rock and mud with them.” Inam asserted that the underground pressure in this case came from expanding natural gas. The latter part is largely reproduced from - http://earthobservatory.nasa.gov/ - which is the source for photos too. The recent earthquake in Pakistan gave me some gyan.. read of a Port located on the shores of the Arabian Sea; 533 km from Karachi and 120 km closer to the Iranian border. It is the port of Gwadar located at the mouth of the Persian Gulf, just outside the Straits of Hormuz in the Gulf of Oman. India has hostile neighbours who often stir trouble and there are border disputes. There is the Tin Bigha Corridor, a strip of land belonging to India on the West Bengal–Bangladesh border, which in September, 2011, was leased to Bangladesh so that it can access its Dahagram–Angarpota enclaves. We all know so well of Katchatheevu or Kachchativu mired by controversies… it is sort of uninhabited island now administered by Sri Lanka. In 1974, India forcibly recognized the Sri Lankan ownership to the island on a conditional agreement. Aksai Chin is a disputed by China. It is administered by China as part of Hotan County in the Hotan Prefecture of Xinjiang Autonomous Region, but is part of Indian Ladakh district. The 1962 war was fought over this and there have been incursions by the Chinese over the Line of Control. So what makes Gwadar unique………. It is a planned free trade port city on the southwestern warm water Arabian Sea coastline – situate in the Balochistan province of Pakistan. It is the district headquarters of Gwadar District and, in 2011, was designated the winter capital of Balochistan province. Gwadar Port is a strategic warm-water deep-sea port developed jointly by the Government of Pakistan and the Government of China at a cost of USD $248 million and officially opened by the President of Pakistan on 20 March 2007. It is in fact one of the few planned cities in Pakistan (others being Faisalabad, Jauharabad, and Islamabad), which have been developed from scratch under an urban master plan. Before its development as a port city, the town was a fishing village. In 2013, Gwadar Port operations were officially handed over to China under a contract. China has strategic interest here as this will enable them to import oil which otherwise would have to go to Shanghai more than 16000 km away ~ besides the time involvement – it saves them of piracy, bad weather and many other risks. In February 2013, Iran announced it would set up a $4 billion oil refinery in Gwadar with an estimated capacity of about 400,000 barrels per day. According to the plan, Tehran will also construct an oil pipeline between its territory and Gwadar to transport crude oil for processing. Gwadar has a long history and they claim their links to the ancient bronze age. It is believed to have been conquered by the founder of the Persian Empire, Cyrus the Great. After the collapse of Alexander's empire the area was ruled by Seleucus Nicator, one of Alexander's generals. For centuries it was under the control of sultans of Muscat. On 8 September 1958, Prince Karim Aga Khan purchased the Gwadar enclave from Oman for $3 million, and gave it to Pakistan and it officially became part of Pakistan. At the time, Gwadar was a small and underdeveloped fishing village with a population of a few thousand. It got integrated to Balochistan province in 1977. In the recent decade, Gwadar has undergone major development with Pak National Highway and the development of the port. A modern airport too was built here. China has paid US$ 360 million to Pakistan for expansion and up gradation to all weather traficcability of Karakoram Highway linking Pakistan with China, as they are heavily dependent upon the oil from the gulf. 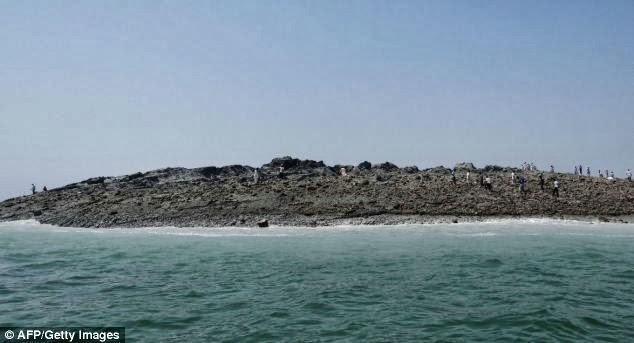 Gwadar is in news after the recent earthquake – and because it became the world's freshest real estate ~ the massive Pakistani earthquake heaved a brand new 18 meter high island above the waves. Daily mail reported that the mountain-like island appeared 600m off Pakistan's Gwadar coast. It has become inhabited as crowds of bewildered people gathered on Pakistan’s southern coast to witness the emergence of a new island. The powerful earthquake caused the seabed to rise and create a small, mountain-like island. Scientists call this phenomenon as 'mud volcano'. They occur where there is a reservoir of loosely compacted sediments buried beneath harder, denser rock and a path is made to the surface. The seismic waves caused a movement of gases locked in the earth under the sea, pushing mud and earth up to the surface along with gas. It is stated that these sudden islands are usually only spotted after strong earthquakes, at least 7- or 8-magnitude events. I personally apologise for not in a position to bring out July and August issues. In this beautiful world full of paradox – some stand in queues for procuring essentials – elsewhere a fancy phone release also draws crowds. Some keep buying even where the is no need but go in for upgrade – the primary model is called essential and higher version ‘smart’….people are willing to pay high prices for the brand / model though most of its features may not be of specific use for the buyer … still…. People rushed to have their Aadhar cards as it was stated that it was linked to to LPG scheme and subsidy……. from the days of cycle delivery, it moved that for a refill, one would need – a Bank Account, Aadhar Unique No. ; have link between the two – then pay the high price, later expect the subsidy to be transferred to their bank account. When we were worried of the deadline, comes the news of Apex Court ordering the government not to withhold any social benefits from those who are yet to get the Aadhar card and not to issue the unique identification card to illegal immigrants. The insane killings in a Nairobi mall takes the world to dark age of hatred ~ one shudders to think of the security of common man who could fall easy prey and sitting target for terrorists. All these and this issue’s Q on a port in Arabic Ocean owned by a country till middle of last century but now developed by its new owning country. We appeal to all our members to collect more funds and involve themselves in all our projects. Collectively, we will march to make the society a much better place to live. Nature is beautiful when it is serene… it is very powerful and can cause devastation too…. Gwadar is a sea port situated in the strategic Strait of Hormuz, located at the apex of the Arabian Sea and at the mouth of the Persian Gulf, approximately 460 km (290 mi) west of Karachi, 75 km (47 mi) east of Pakistan's border with Iran and 380 km (240 mi) km northeast of the nearest point in Oman across the Arabian Sea. During the last century Gawadar was under Omani rule ~ Pakistan purchased the Gwadar enclave from Oman for $3 million in Sept. 1958. Balochistan is an administrative province of Pakistan, bordered by Afghanistan to the north and north-west, Iran to the south-west, the Arabian Sea to the south; Quetta is the capital and largest city of Balochistan. The main ethnic groups in the province are Baloch, Pashtuns and Brahuis, and there are relatively smaller communities. Every now and then, the brute power of nature subdues mankind, often leaving a disaster in its trail…. there is news of a major earthquake in Pakistan on 24th Sept. 2013 afternoon in which more than 200 people are feared killed [later reports suggest that the death toll is well over 300] due to the powerful earthquake in Pakistan's remote south-west province of Balochistan. BBC and other news agencies report that it measured 7.7 magnitude in Richter scale. Reports suggest that the intensity was so high that quake created a new island off the coast. The United States Geological Survey said the 7.8 magnitude quake struck 145 miles southeast of Dalbandin in Pakistan's quake-prone province of Baluchistan, which borders Iran. The powerful quake pushed up a 40 to 60 feet high and around 200-foot-long land mass in the sea near the port city of Gwadar in Balochistan. It is stated that soon after the quake the land mass emerged around 600 m from the coast. Some reports state that such an island had emerged in Gwadar in 1960 also. Due to the impact of the quake, many houses were reportedly flattened and thousands of people had to spent the night in the open. The latest quake was so powerful it was felt as far away as Karachi, Hyderabad, and India's capital, Delhi. Entire villages are reported to have been flattened in the impoverished and sparsely-populated district of Awaran. Reports quote Balochistan government spokesman as putting the death toll at 238, more than 200 of the fatalities in Awaran town and the surrounding villages. The army has sent more than 200 soldiers, medical teams and tents from the regional capital Quetta, but the mountainous terrain is said to be hampering the rescue operation. Scientists believe the 7.8 magnitude earthquake, which struck 145 miles southeast of Dalbandin in Baluchistan, triggered what is known as 'mud volcano'. They occur where there is a reservoir of loosely compacted sediments buried beneath harder, denser rock and a path is made to the surface. The seismic waves caused a movement of gases locked in the earth under the sea, pushing mud and earth up to the surface along with gas. These sudden islands are usually only spotted after strong earthquakes, at least 7- or 8-magnitude events. Such land masses have appeared before off Pakistan's Makran coast, a hydrographer is quoted as stating. After quakes in 1999 and 2010, new land masses rose up along a different part of the coast about 282 kilometers (175 miles) east of Gwadar, he said. However, each of those disappeared back into the sea within a year during the monsoon season, a period of heavy rain and wind that sweeps Pakistan every summer. As Chennai saw milling crowds at Beach and Zoo, elsewhere Police had to control the Crowd in a hard way ! Do you know of ‘Siri’ – the intelligent assistant ? - that helps you get things done. All you have to do is ask. In fact you can order your wants – ‘Do I need an Umbrella’ – ‘where is the nearest ATM’ – you have seen some Advts where the man with smart phone makes a smart search to impress the road-side girl. That is available on ‘ iPhone 4 ’ - a touchscreen slate smartphone developed by Apple Inc. It is the fourth generation iPhone, and successor to the iPhone 3GS. It is particularly marketed for video calling (marketed by Apple as FaceTime), consumption of media such as books and periodicals, movies, music, and games, and for general web and e-mail access. It was announced on June 7, 2010, at the WWDC 2010 held at theMoscone Center, San Francisco, and was released on June 24, 2010, in the United States, the United Kingdom, France, Germany and Japan. The iPhone 4 runs Apple's iOS operating system, the same operating system as used on prior iPhones, the iPad, and the iPod Touch. It is mainly controlled by a user's fingertips on the multi-touch display, which is sensitive to fingertip contact. The much-anticipated release of the iPhone 4S in China stumbled out of the gate in Beijing, after unruly crowds kept the store closed on release day. Apple’s main store in the Sanlitun district of Beijing, the first of its kind to open in the country, was pelted with eggs and minor scuffles as they were not able to open the shop due to surging crowds. Apple said in a statement that it had temporarily suspended sales of all iPhones at its five locations in China due to concerns for the safety of customers and employees. Reports stated that the crowd became unruly, and began pelting the store with eggs. The iphone4 is reported to cost around Rs.45000/- - the crowds that came on day 1 may not be the genuine users but many trying to buy for a resale at a higher rate. Some reportedly were hired for standing in the Queue and buying one for somebody else. Apple did not say when sales of the iPhone 4S in China would return, but their products reportedly were still available online. This is not the first time that Chinese shoppers have exhibited frenzy over newly released Apple products. While the massive crowds shown mobbing the Apple store in Beijing may shock some, there's actually a very simple explanation. There are reports that the massive crowds were not even a sales hype but included large no. of professional scalpers looking to buy up the coveted device for resale on the grey market at inflated prices. Just as Cinema theatres resort to limited sale to curb blackmarket sales, the Shop were to allow shoppers to purchase only 2 iphones per customer. The other effect of this is that the no. of persons waiting to buy grows and thus causes swell. Scalper is a person trading in the equities or options and futures market who holds a position for a very short period of time in an attempt to profit from the bid-ask spread. They are persons who buys large quantities of in-demand items, such as new electronics or event tickets, at regular price, hoping that the items will sell out. The scalper will then resell the items at a higher price. Such transactions often occur on the black market. This type of scalping is illegal under certain conditions. PS: made on 1st Feb 2012.... remained in my draft and posted now.. !! 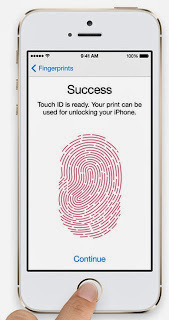 the new Apple iPhone 5S .. finger print technology and how hacked ? Will people stand in queues to buy a product [not in ration shops !!] There are basic requirements, essentials, things of utility value and more….. and there is one thing that people keep buying when they already have some and the newer is one is not required or does not add any further utility value ~ but it is fancy buying as people tend to continuously upgrade……… it is the ubiquitous ‘mobile phone’. Interestingly, the basic model is called ‘essential’ ~ the improved versions are called ‘smart’…….. there are phones and i-phones…… the user interface is built around the device's multi-touch screen, including a virtual keyboard; it has Wi-Fi and cellular connectivity (2G, 3G, 4G, and LTE); can shoot video; take photos, play music, send and receive email, browse the web, send texts, and receive visual voicemail – provides functionality of video games, reference works, GPS navigation, social networking, etc. - the App Store offered more than 775,000 apps by Apple and third parties. …. That is iPhone for you, designed and marketed by Apple Inc. It runs Apple's iOS mobile operating system, known as the "iPhone OS". The first generation iPhone was released on June 29, 2007; the most recent one that is raging a storm is iPhone 5C and iPhone 5S. There are six generations of iPhone models, each accompanied by one of the six major releases of iOS. The resounding sales of the iPhone have been credited with reshaping the smartphone industry and helping make Apple one of the world's most valuable publicly traded companies. A chip with 64-bit architecture; a fingerprint identity sensor; a better, faster camera ~ and an operating system built specifically for 64 bit. iPhone 5s is precision crafted down to the micron is what they advertise it to be ….. it claims to have beautiful aluminium housing – encasing the sleekness of metal and glass; Sapphire crystal in the Home button and more sapphire crystal protecting the iSight camera. The iPhone 5s looks and feels unbelievably thin and light - available in three elegant expressions: gold, silver and space grey. In modern day World of marketing hypes, iphone is a real hit. Apple Inc logged 9 million in sales for iPhone 5S and iPhone 5C models in their first three days on the market, the most successful iPhone launch ever. Apple shares rose more than 5 percent to $493.47 in early trading on Monday following the news. Demand for the iPhone 5s has exceeded initial supplies, and many online orders are scheduled to be shipped in the coming weeks, the company said in a statement. When Apple unveiled the iPhone 5 a year ago, it sold more than 5 million in the first three days after its launch. On the day of its launch, long lines formed outside stores in Tokyo, New York, San Francisco and other cities for Apple's new top-of-the-line iPhone 5S and the less-expensive iPhone 5C. 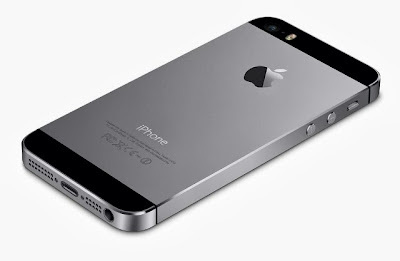 In searching some popular websites, it is found that new Apple iPhone 5S Price in India is Rs 52000 and less in some. As expected, the iPhone 5S has made its way to India’s grey markets over the weekend. In Delhi, it is stated that prices started from Rs 90,000 but have now settled down to Rs 75,000 for the 16GB variant. The few units of the gold iPhone 5S that came were seen selling for as high as Rs 115,000 and are now next to impossible to find. In Mumbai, we are hearing reports of the iPhone 5S selling for Rs 100,000. Though not high in demand right now, a few units of the iPhone 5C have also made their way to markets here. 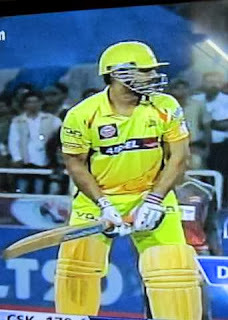 But with no real demand, these are selling for about Rs 45,000. Apple has not yet revealed the date or price for India launch. And……….. what is claimed to be a novel safety feature went for a toss within almost 48 hours……. With someone exhibiting their way to beat the system and finding a way around. A member of the German hacker organization Chaos Computer Club posted a video to YouTube Sunday showing one of the new iPhones being hacked with a lifted fingerprint. 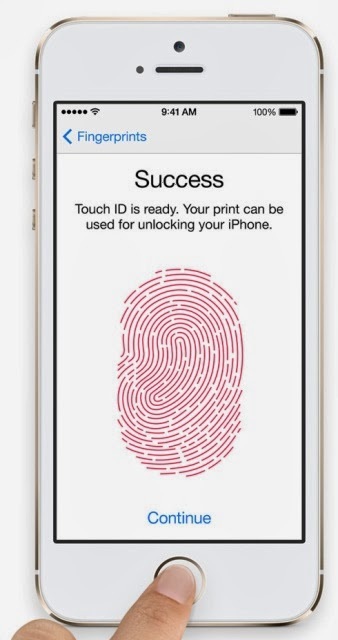 Despite Apple’s tall claims about the advanced security of the Touch ID, the CCC says Apple’s sensor is just a high-resolution version of existing technology and can be cracked with a sharp photo of the fingerprint and a laser printer. A spokesman for the organization is quoted as stating that speedy hack illustrates the inherent risks of using fingerprints as a security measure and urges Apple customers to return to numeric passcodes to protect their phones. There were some fears that criminals would go the extent of cutting a finger ever……. Far-fetched it may sound though…. But the one exhibited was much simpler…….. “First you need some kind of colored powder or superglue to lift the fingerprint. Then you have to scan the fingerprint, invert it and print it with a resolution of 1200dpi or more onto a transparent sheet. … If somebody is willing to go through all of this to break into your phone, chances are you have bigger issues than fingerprint security.” It is stated that Security experts Nick DePetrillo and Robert Graham have been pooling a crowd sourced bounty for the first person to bypass the iPhone fingerprint reader and that way CCC has perhaps won an estimated $6,400, plus almost 23 bitcoins and at least nine bottles of alcohol. Govt. policies do change, especially when there is change in Government….. but something supported and promoted so much by this Govt. 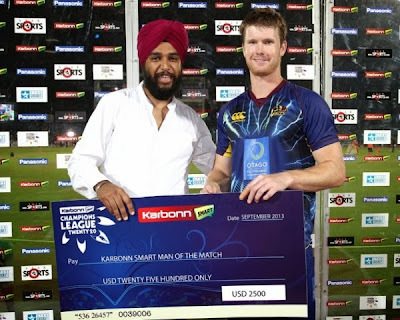 is going for a toss – and alongwith it crores of investment !! ……. You may or may not have Aadhar… but sure would know of it… the 12-digit supposedly unique number which the Unique Identification Authority of India (UIDAI) was to issue for all residents. The number will be stored in a centralized database and linked to the basic demographics and bio metric information – photograph, ten fingerprints and iris – of each individual. The Aadhaar data collection programme is the largest biometric data collection programme in the world without any data protection law or data protection authority to provide any privacy safeguards. A couple of days ago, UIDAI chairman Nandan Nilekani expressed hope that the target of issuing 60 crore Aadhaar numbers would be met by 2014, saying that so far 40 crore people have already received them. In most parts of Tamilnadu the Aadhar programme is on in right earnest – there are delays, snarls, system error – still the work is on……… also personally experienced that though details such as Voter ID; passport; PAN etc., were all provided – not all captured and when captured, only for the head of the family and not for all !!!! Briefly, the National Identification Authority of India Bill, 2010 introduced in Rajya Sabha on 3 December, 2010 was referred to a Parliamentary Committee and Aadhar was born reportedly with a view to ensure that the benefits of centrally sponsored schemes reaches to right person and not misused. The Unique Identification Authority of India (UIDAI), is an agency of the Government of India responsible for implementing the Aadhar scheme. The agency which is part of Planning commission, is headed by a chairman, who holds a cabinet rank. Nandan Nilekani, former co-chairman of Infosys Technologies, was appointed as the first Chairman of the authority and there have been much news than its making or issuance…..
Govt is hell-bent on making its Direct Cash transfer scheme a grand hit. To make it a success, Govt linked it to LPG scheme and subsidy and stated that LPG would be sold at market price and the subsidy would be credited to the bank accounts thus making the linkage between bank accounts and Aadhaar number. So, from the days of cycle delivery, it moved that for a refill, one would need - a Bank Account, Aadhar Unique No. ; have link between the two – then pay the high price, later expect the subsidy to be transferred to their bank account. The deadline was drawing to a close…….. and now comes the news that the Supreme Court has ordered the government not to withhold any social benefits from those who are yet to get the Aadhar card and not to issue the unique identification card to illegal immigrants. The interim order of the Apex Court bench states that "No benefit of service shall be denied on account of non-possession of Aadhar, and no illegal immigrants would be issued Aadhar." The SC bench, comprising Justices BS Chauhan and SA Bobde, has thwarted the governmental attempt by directing that Govts should not link subsidies and social welfare benefits to the possession of Aadhar cards. Surprisingly, it is noted that the Solicitor General on behalf of the Govt tendered before the Court that Aadhar was purely voluntary and denied all the charges raised in the PIL filed by retired Karnataka High Court judge KS Puttaswamy. The petition claimed that different governments have linked social benefits to Aadhar which resulted in many people being denied these benefits. It cited several examples such as Maharashtra paying salaries to teachers only into Aadhar card-linked bank accounts and such cards being made mandatory in Jharkhand for registration of marriages. Represented by senior lawyer Anil Divan, the petition also claimed that Aadhar cards are being issued indiscriminately to all, including illegal immigrants, posing a huge security risk to the country. The whole process was rushed through vide an executive order for political ends, the petition alleged. The PIL also claimed that the UID was in violation of Article 21, right to life guaranteed by the Indian Constitution, as it was against a person's right to privacy. Only recently, papers were awash with speculation about Nandan Nilekani, Chairman of the Unique Identification Authority of India (UIDAI), would fight the next Lok Sabha elections on a Congress ticket. His contesting the elections and affiliation to a party is no news ~ he is an articulate person but it appears clear that there was no legal backing to the scheme and it has not gone well within the party circles as well. Interestingly, there was an article in Firstpost calling the Aadhar scheme, a Trojan horse gifted by a dysfunctional government which will ultimately compromise our security without even a figleaf of statutory protection for our privacy. It has been sold as a means to reach government benefits to the poor, but it could well end up as one more tool in the hands of the powerful to exclude some and extract speed money from the rest. Other than the legality, the article points out that there is no such assurance to Indian citizens that their fingerprints will not fall in the wrong hands. The idea of keeping an entire population’s biometric and personal details – every man, woman and child living in the territory of India, even if not a citizen – in huge databases is scary. Some 1,210 million people will stand exposed when UIDAI is completed. No country has ever done this for unstated purposes, though the US does so for social security, and has strong laws protecting people against misuse. The Aadhar data falling in private hands makes it too vulnerable for impersonation and all other associated evils. It points out that contrary to the purpose of weeding out duplicate / fake identities, it could breed more corruption; the author is wary of the safety breach that one’s assets and financial status could be known to unscrupulous elements……… and hence the scheme itself is not trustworthy………. As you read more, you tend to get carried away in to scarier details ~ and one does not know for sure –whether to feel happy with the present Apex Court directive …. !! You encounter them so often ~ in life as also in Office, there are people who tend to ask too many personal details and speak of the personal life of others …………. snoop (V) : to pry into the private affairs of others, especially by prowling about. prying (V) : to inquire too inquisitively into a person's private affairs. Not so surprisingly there are Nations who snoop ….. the surprising element that some Nations do not react when reports reveal that they have been snooped !!! ~ but what will a Nation do with personal data like FB is not understood by a commoner like me. Elsewhere, the US denying the Venezuelan president the right to fly over Puerto-Rico was termed as an insulting juvenile escapade and example of the incredible clumsiness of the US government towards Latin America. If you are wondering what all this is about……. remember the disclosures and my earlier post on PRISM - a clandestine national security electronic surveillance program operated by the United States National Security Agency (NSA) since 2007; and the leaks by a NSA contractor who claimed the extent of mass data collection was far greater than the public knew, and included "dangerous" and "criminal" activities in law. The whistle blower who is hardly 30 has been on the run since..... hours after his real identity was revealed, a petition was posted on the White House website, asking for "a full, free, and absolute pardon for any crimes he had committed or may have committed related to blowing the whistle on secret NSA surveillance programs. That was all about - Edward Joseph Snowden - a US former technical contractor for the National Security Agency (NSA) and Central Intelligence Agency (CIA) employee who leaked details of top-secret US and British government mass surveillance programs to the press. Snowden's leaks are said to rank among the most significant breaches in the history of the NSA. Now there is growing concern as it is stated that among the BRICS group of emerging nations, which featured quite high on the list of countries targeted by the secret surveillance programs of the U.S. National Security Agency (NSA) for collecting telephone data and internet records, India was the number one target of snooping by the American agency. In the overall list of countries spied on by NSA programs, India stands at fifth place, with billions of pieces of information plucked from its telephone and internet networks just in 30 days. Earlier the Minister for External Affairs Salman Khurshid even defended the U.S. surveillance program by saying that “it is not… actually snooping,” ~ now it is not simple snooping but bundles of metadata taken….. The Hindu quoting technology experts states that a detailed account of an individual’s private and professional life can be constructed from metadata, which is actually the record of phone number of every caller and recipient; the unique serial number of the phones involved; the time and duration of each phone call; and potentially the location of each caller and recipient at the time of the call. The same applies to e-mails and other Internet activities of an individual. The high volume of metadata taken from India — 6.2 billion in just one month — means that the U.S. agency collected information on millions of calls, messages and emails every day within India, or between India and a foreign country. The information collected is part of a bigger surveillance system. The metadata is machine-readable, and therefore searchable, and thus it makes intensive surveillance possible as the record of a person’s email logs, phone records and clickstream — all the websites visited ever………… even with the millions of mobile phones in use in India, this amount of data is too huge. While U.S. carriers have maintained a studied silence on the issue, India has not made any furious reaction. This possibility not only significantly compromises India’s network security but also national security, since domestic call records could relate to top secret calls between politicians, bureaucrats and armed forces officials who lead India’s strategic defence planning. The Govt for sure would state that this has not compromised the privacy of Indian citizens in any way ~ but can Nation afford to remain so lax is the crucial Q ~ loads of Facebook data may not mean much of Govt. policies and activity while the same cannot be true of e-mail and telephone communication ~ and whatever be how can any Nation be it a Super power access information in such a manner and what this undignified response so far reveals ~ lack of gumption or the strength to respond ????? ~ and a servile attitude. 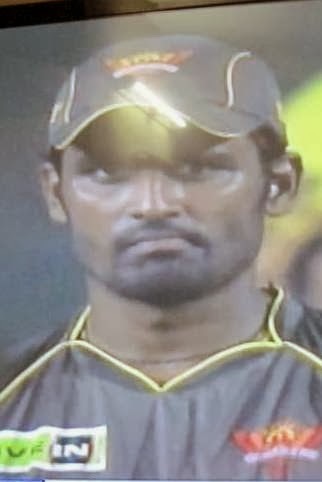 Sad indeed. At first look, they seemed a bit odd ~ not the official dress that one would expect in a business meeting ~ and far different than the normal South Indian way… In our Company, we have had business meetings, have listened to various speakers, have seen nice powerpoints and … but this one at Rajpark on 29th Aug 13 was different. In focus were 3 men with white kurtas with a typical ‘white cap’…. It was told that they have ‘six sigma quality certificate’ though they reportedly did not even apply for the same. This post is nothing about their Quality Certificate, global business fan club, appreciation from Prince Charles, Virgin Group Richard Branson and more……… but some aspects which genuinely impressed me and most of my other colleagues present there. Taste buds contain the receptors for taste. Located around the small structures on the upper surface of the tongue, this is what detects the five elements of taste perception. It is stated that on an average, the human tongue has 2,000–8,000 taste buds. Many of us just devour the food that is kept on the plate, some taste it, some enjoy and appreciate the maker….~ there are connoisseurs who are experts in the matters of taste and it is very difficult to please them unless real quality food is delivered. Chennai [specifically Triplicane] is bachelor’s paradise… and those staying away from families eat in Mess / small hotels. There is this ‘Ratna Café’ in Triplicane, very famous for its sambar idly. There are chains of restaurants like Saravana Bhavan, Hot chips, Vasantha Bhavan, Woodlands…. and more having become famous for the tasty food that they give to their customers ~ and customers would not mind travelling distance to have the food in their preferred place, even when many hotels would be available in the vicinity. You also find many two-wheelers zipping around making that ‘delivery’ [not of pizzas] of the choicest food ordered ~ why would somebody order a dosa or idly from a restaurant far away – when you have hotels, mess and more in dozens… !! This is something on ‘dabbawalas’ 0r tiffin-box carriers !! ~ would you need somebody for bringing your lunch box – may not be in Chennai – but in Mumbai it is a big, neat, well organized business. It would look pretty simple – somebody who runs the errand of picking your lunch box from home, delivers to you at your office, then picks the empty box delivering it back home. It for sure needs specilisation, commitment, highly organized skills to run this service. They are more than a century old ~ and go about their business in style irrespective of Sun or shine braving the vagaries of weather, congested traffic, milling population and more. One need to understand the magnitude of dealing with millions of customers and keeping them all happy. A force of 5000 odd men – working non-stop on all days except Sunday and delivering 200,000 boxes every day… amazing. On the basis of a Harvard Business Review it is stated that the wrong-delivery is less than 1 in six million. Close to impossible task, indeed. Their rise to celebrity was after the visit of Prince Charles and his invitation to royal wedding in Apr 2005; Virgin Chairman Bronson visiting them, BBC producing a documentary and then loads of appreciation in the native press. ~~towards the middle itself, one was so awe-struck that it did not looked a wonder when the spokesperson explained at length on how Prince Charles evinced interest in meeting them [or rather seeing their pattern of work] and how the Dabbawalas took the call on timing and location of the meet. 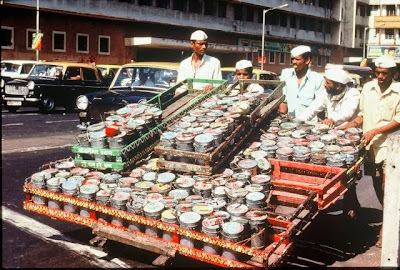 Prince Charles was so impressed that Dabbawalas were officially invited for the Royal wedding and the nice gesture was indeed a deserving one for their commitment. 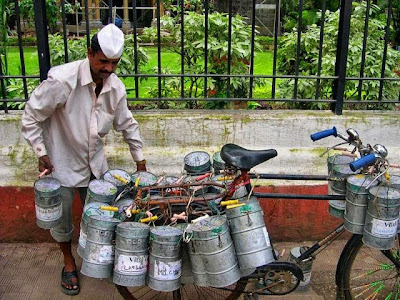 Each dabbawala, [most of whom are only 8th standard] is a share holder – is not an employee and thus exhibits utmost sincerity. The spokesperson claimed with satisfaction that in more than century of service, their organization never ceased work – but for a solitary occasion, when they went on strike expressing their solidarity with Anna Hazare’s movement against corruption. A day in dabbawalahs’ successful life is not complete with local train and cycle – the important cogs in their wheel of success. 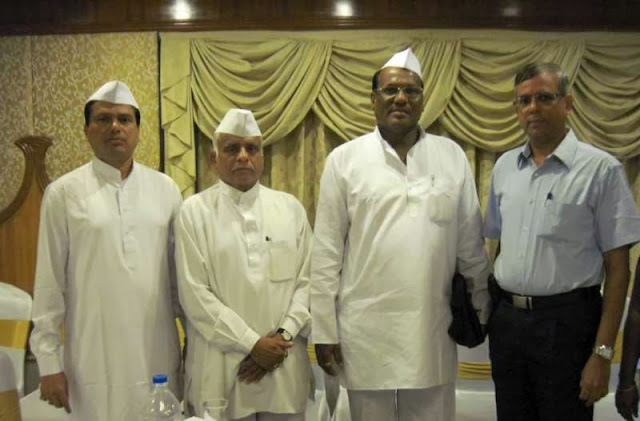 The ones we had occasion to meet were the Founder president of the Mumbai Dabbawala Association- Mr.Raghunath D. Medge; General secretary Gangaram Talekar and Arvind Talekar who was the spokesperson…. Tracing their history and path to continued success, Mr Talekar said that it was once threads which provided the code to success. Not any complex algorithm or path-breaking code developed by a Programming architect. He categorically denied the mistaken conception that they were in handling ‘waste food management too’. After the hour-length talk, there was a barrage of Questions. The responses were simple, straight and practical – the ones that came with ‘no home-work’ or with no extra lacing. The answers and lecture clearly displayed their commitment, their simple and honest way of life, ethical ways of dealing with their customers, the pride with which they carry on, the devotion to duty, the strong belief in their ideals and fear of God. Most of us left the hotel admiring their commitment ~ the next time you happen to see them in Mumbai, sure you would look them with more respect and affection….. thanks to my Office for providing this opportunity.